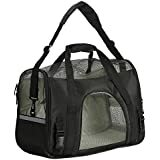 SMALL PET CARRIER WITH PADDED SHOULDER STRAP:The shoulder strap is padded to make carrying as easy as possible. Besides the hand carrying straps, this pet carrier also has straps on both sides to make access to car seatbelt. 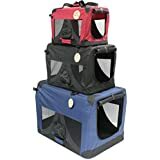 CARRIER BAG FOR PUPPY AND KITTY WITH ZIPPERED CLOSURES -47cm x H: 23cm x W: 33cm,Its ingenious excogitation absolutely benefits you: Half-zip opening on one side, full-zip opening on the other side for easy loading. 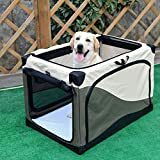 PORTABLE AND LIGHTWEIGHT :It is made of oxford with two handles, very light and portable, you can take it anywhere with ease. 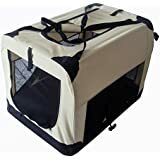 DOG & CAT CARRY SACK WITH REMOVABLE BOTTOM CUSHION - This pet carrier is made of durable, lightweight, waterproof nylon and mesh materials. It is furnished with a removable pad for easy cleaning. A POCKET ON THE TOP :pocket on the top gives you a place to keep essentials for your pets, such as a leash or snacks. Hand carrying straps and adjustable padded shoulder strap allow for many carrying options. Environmentally friendly materials are safe, non-toxic, have good coloring, weather resistance and stability. 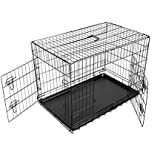 The curtain can be stored, and the velcro can be fixed after the roll is rolled to keep the cage door open.